The Ontario Heritage Trust and the Chippewas of Nawash unceded First Nation co-steward lands in northern Bruce Peninsula that are part of an Indigenous cultural landscape known as Nochemowenaing. These environmentally sensitive lands are sacred to the Anishinaabe peoples. 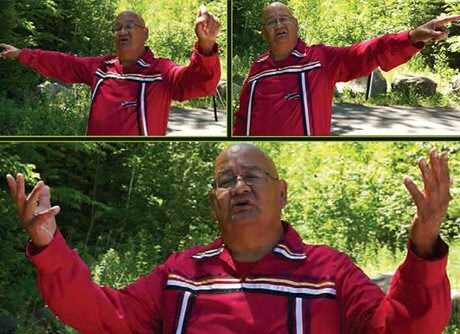 Recently, the Trust’s Sean Fraser talked with Nawash elder Miptoon (Anthony Chegahno) at Nochemowenaing about the site’s special meaning and significance. Sean Fraser: Why is Nochemowenaing significant to you, the Nawash and Anishinaabe people? Miptoon: It holds a great sacredness for the Anishinaabe people – especially those from my community, Neyaashiiningmiing (Cape Croker). Prior to European contact, the Anishinaabe peoples used this area for many ceremonies – as a place to bring the sick and the ailing, as well as a final resting place where they could make their peace with the Creator. Nochemowenaing is a place of great respect where we gather for our journey to the star people. It is not to be wandered through without permission, or traversed aimlessly. When we come here, we must offer tobacco and walk sacredly in the steps provided for us by our ancestors. You’ll find various medicines throughout this landscape that have been given to us by the Creator. Even as far away as Wisconsin and Michigan, the Anishinaabe peoples have heard of this place. It holds great significance for me, the Chippewas of Nawash and for all Anishinaabe people across Canada. Sean: How did you personally come to know about and understand this place? Miptoon: My dad never mentioned it by name, but I know that he held it in great reverence. When we’d be working on the other side of Hope Bay, he would often look across the water. He would become still, held in deep thought. We would often ask him what he was doing. I know that he was reflecting on the importance of what he saw across the bay. It was Nochemowenaing. I believe that our knowledge of the place was passed on verbally. As our ancestors traded throughout the great lakes, this information was shared with other communities. And this is how it was passed on to me. Sean: Why can it be difficult to share and explain the value and meaning of Nochemowenaing? Miptoon: We have to be open-minded and clear about our preconceived thoughts of what the landscape is. If land is looked on as a commodity, that’s all it’ll ever be. But, if we look at landscape as the community – something that is for Neyaashiiningmiing to appreciate and respect – then we can begin to approach it sacredly. This place should never be owned because it’s a community and it holds great community value. Sean: How are the Anishinaabe people and, in particular, the Chippewas of Nawash connected to Nochemowenaing? Miptoon: Our ancestors are buried here, and there are stories that are held deep in this place and within the thoughts of many elders. Long ago, one of the elders stopped by here when he was fishing to seek refuge during a great storm. And while he was here, he didn’t make the right offering. During the night he felt a strong presence and became so afraid that he was forced to return to the Nawash side of Hope Bay. This place must always be treated with the greatest of respect. Sean: What are the challenges of preserving the landscape and the meaning of Nochemowenaing? Miptoon: Preservation is something that we, as human beings, need to learn. We should learn, too, that land can’t really be owned, and that as Anishinaabe people, we welcome others with open arms to walk and to see what I see here now. This is something that we will always cherish and hold because our ancestors have said to us “honour the words passed on to you.” That’s what I’m trying to do even as I am teaching and sharing with you today. It’s important that you understand the sacredness I feel when we walk across the land. Sean: For whom do you protect and steward Nochemowenaing? Miptoon: When I first heard that archaeologists found fragments of bones here, it saddened me because we knew this was a sacred place. Yet, generations ago, this property was sold without the consultation of the Nawash or Neyaashiiningmiing. It saddens me now that I see a paved road and development nearby. We’ve got to learn to walk together and trust in everything that we do. I want my grandchildren to see what the ancestors left for us and to share the happy thoughts in what they saw. I believe that we have to protect this place to the best of our ability. There should be no more development here. I will always sense that the Great Spirit’s head hovers over Nochemowenaing. Sean: How does Anishinaabe law and tradition inform how you protect Nochemowenaing? Miptoon: Anishinaabe law is one of the hardest things for us to try to describe. What are we actually talking about? Are we talking about the bird that I hear singing to my right? The birds that I see flying above the escarpment, or the whispering trees as the Creator’s breath flies through them so mildly? I listen to these things and realize that this place holds great importance to us as Anishinaabe people. It’s got to be part of your heart, your very being in everything that we do. We must protect this at all costs. The friends and neighbours that we have who are willing to walk with us to see the preservation of this land brings peace and comfort to my soul. This will also bring peace to the ancestors who have been restless while nothing was done for the last 40 or 50 years. Sean: Before the arrival of the Europeans, how was land shared by the various Indigenous peoples, bands and nations? Miptoon: There is no Anishinaabe word for ownership of land. Everything was shared. It was all held in trust. Yes, we had conflicts, but land wasn’t owned per se by individuals or big companies. Land was meant for everyone to walk through, respectfully, honestly and just to thank the Creator for all the good plants, the good trees and everything that was given to us. We hold the land in high esteem, and that is how I want to leave it for the generations that follow. Oneness comes from the rising of the sun – “Beedahbun,”’ which means “as dawn arrives, nature wakes and greets the sun, sings every day.” How appropriate that this place was chosen as a place of healing, a place of respect. As the sun comes up, the elders heard the birds and all of nature awakens to greet the day. We don’t do this anymore. What wakes us up now is the alarm clock. Listen to what we’re saying, Canadians, and learn, once again, to greet the sun first thing in the morning and as it sets. Sean: What do you think is often misunderstood about Indigenous cultural landscapes? Miptoon: During the many years of silence, we allowed the government to speak on our behalf. As the Anishinaabe people began to be educated about their past, they realized that many things weren’t always accurately portrayed. We realize now how important it is for us to speak for ourselves, to develop partners so that we can walk and help preserve what the Creator has given to us. Sean: What should all Canadians know and recognize about this special landscape? Miptoon: I hope that they open their eyes to the reality of the sacredness, and put away pre-conceived ideas that sacred land should be developed. Some people think that this is a great point for building houses and cottages, but that’s not so. I hope that we learn to walk respectfully when we come here. And that we allow nature to speak to us and allow the Creator to speak to us and say, “this is a special place; this is where the ancestors are.” All Canadians must put away their pre-conceived ideas and negative attitude toward Anishinaabe people. Once these are laid aside, I believe that all across Ontario and Canada, we can come to some sort of resolve and learn to walk in oneness. If we don’t have oneness with nature, we don’t have oneness with all human beings. We’ll always have that divide. Sean: What holds you back from entering into the heart of these lands? Miptoon: When you first asked where we could meet to talk about Nochemowenaing, I was thinking we would meet in downtown Toronto. You also suggested the Band Office at Cape Croker, but that just didn’t seem right. Then, you must’ve had a profound thought from the Creator when you said, “Let’s do the interview on site,” which really meant a lot to me. And how appropriate this is, because this morning we can hear all the birds singing. They seem to condone what we are doing. They are the protectors. We can hear the warning songs that are meant for us. That bird to my right is saying, “I’m here and I’m watching you.” It is not a place for archaeologists to find artifacts or for people to go on guided tours. This should always remain a respected and protected sacred place. An elder who came to the site once told me that he didn’t need to go down to Nochemowenaing. He said, “I don’t feel it in my heart. Just tell me about it and that will be enough.” I was honoured by that respect. I really appreciate people who don’t need to walk down to the point and can experience the place through the words. This way, the meaning sinks deeper into your heart. Listen to the ancestors and the elders who tell you their stories about Nochemowenaing. You don’t need to walk through here. Anthony Chegahno, whose Anishinaabe name is Miptoon, is an elder, a resident of Neyaashiiningmiing and a former band councillor for the Chippewas of Nawash unceded First Nation.